The eyes of owls are 10X more light-sensitive than human eyes. So while they can see perfectly well in daylight, they also have exceptional night vision. Their eyes are very large and unable to move inside the eye socket. But owls have very flexible necks and are able to swivel their heads in a 270 degree arc. By being able to pivot their heads three-quarters of the way around, they can look just about anywhere without moving their bodies. Their eyes are located on the front of their faces, which allows them to have binocular vision. Owls have the most highly developed sense of hearing of all birds. Their ears are located on either side of their head, at slightly different levels relative to their eyes. As a result of these ‘off-set’ ears, sounds reach each ear from a slightly different direction. This provides the owl with a three-dimensional “aural map” of that sound, which allows them to pinpoints the sound’s location with incredible accuracy. This is why, when you are standing quite far behind an owl and suddenly sneeze, they are able to turn their head all the way around and look straight at you. 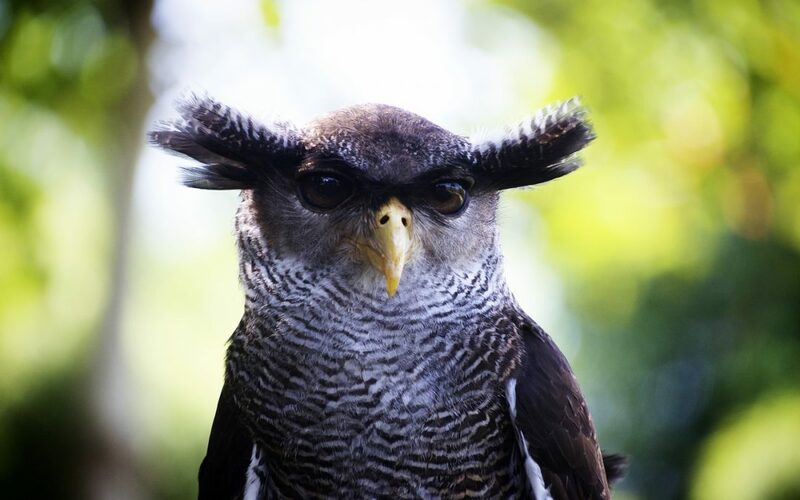 Another reason for their incredible hearing ability is due to the disk-shaped face that all owls have; the feathers which form the disk are oriented to focus sound waves towards the ears, in much the same way that a satellite dish deflects radio waves to a signal receiver. An owls’ ears are actually hidden beneath their feathers; the “ear-tufts” on the top of the head of some owls are not ears but simply feathers which aid in camouflage and allow recognition between individuals. Researchers have found that some owls, like the Barn Owl, can locate and catch prey in complete darkness, even if both the owl and the prey are moving. Field observations have found that Great Horned Owls and Great Gray Owls can hear mice and voles moving under a layer of snow from up to 300 meters away. The owls will then fly over to where they heard the prey and drop into the snow, trapping the vole and grabbing it with their very powerful claws. Some owl species are diurnal (active during the day) but most owls hunt at night, which is why they are seldom observed by humans. Owl wings make no flapping sounds as they fly. The leading feather on each wing has a serrated (toothed) edge which disrupts air flow over the wing and eliminates the usual whooshing sounds associated with flapping wings. This way, potential prey never hear the owl’s approach. Owls, like all birds, have no teeth, so they swallow their prey items (such as mice) whole. Their gizzard (equivalent to a stomach) removes breaks down the prey into and moves everything into the intestine, except for the for the fur and bones of the mouse. These are regurgitated by the owl in the form of a small round pellet. Pellets are usually regurgitated while the owl is roosting on one of several perches they use within their territory. If that same perch is used for several years, the pellets will blanket the ground underneath. The pellets dry quite quickly, after which they can be teased carefully apart, a practice done by many bird ecologists. This is perfectly safe to do as they are composed solely of fur and bones (or even insect parts with some owls). Once the tiny skulls in the pellets are identified, ecologists can determine a detailed picture of the diet of that owl.